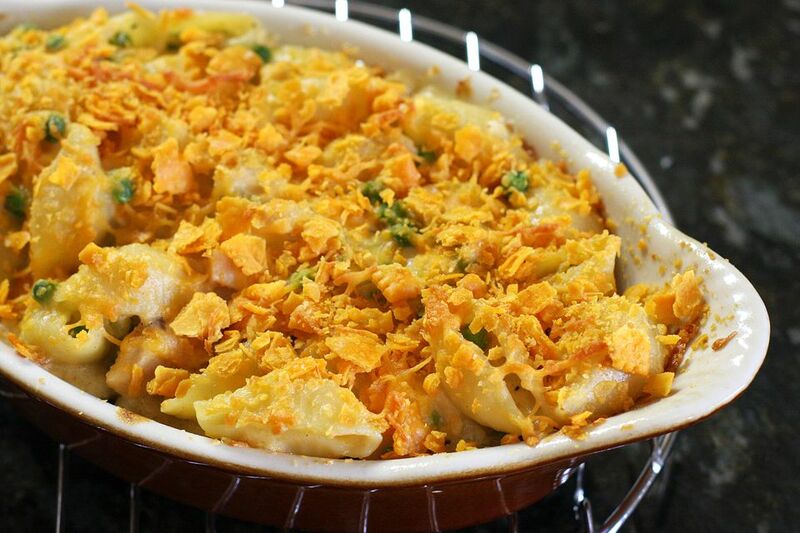 The cheese cracker topping sets this tuna casserole apart from all the rest. The pasta shells and a rich cheese sauce make it a satisfying one-pot meal. Onion and celery are the vegetables called for in the recipe, but feel free to change them up to suit your taste. Green onions, diced frozen carrots (cooked), mushrooms, and bell pepper are just a few of the possibilities. Grease a 3-quart baking dish. Heat oven to 350°. Cook pasta in boiling salted water following package directions; drain, rinse, and set aside. In a large skillet or sauté pan over medium-low heat, melt butter. Add celery and onion; cook, stirring frequently until vegetables are tender. Add garlic and cook for 1 minute longer. Stir the flour into the sauteed vegetable mixture along with the Creole seasoning and pepper. Cook, stirring, for 2 minutes. Gradually stir in the chicken broth and sherry. Bring to a simmer and continue cooking, stirring occasionally, for 2 minutes. Stir in milk and about 1 1/2 cups of the cheese. Continue cooking until the mixture begins to simmer again and cheese has melted. Break tuna up and stir into the sauce along with the peas. Combine the sauce mixture with the drained pasta. Spoon into the prepared baking dish. Crush the crackers and combine with the remaining 1/2 cup of shredded cheese. Sprinkle over the casserole. Bake for 20 to 25 minutes, until bubbly and lightly browned.